The Board of Trade Building Fort Worth Texas. The Board of Trade Building at the NW Corner of 7th Street and Houston in Fort Worth was built in the 1880s and is regarded by some to be the first skyscraper in Fort Worth. The number of stories is hard to determine from the image (left). 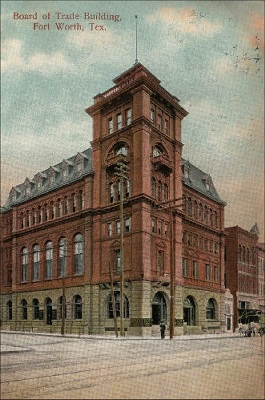 The building also served as the Fort Worth post office for a time and later as the offices of the Continental National Bank (1905). The exterior was a combination of stone, molded and pressed brick and terra cotta. The interior had mosaic tile floors, wainscoting of polished oak and cherry paneling. Leaded glass windows and frescoed ceilings was icing on the cake. It was demolished sometime prior to 1949 to provide parking space. Anyone wishing to share information, memories or photos of razed architecture in Texas, please contact us.